Other than the name, the biggest difference between Performas and regular Macs was that Performas were not sold by regular Apple dealers and came bundled with programs like ClarisWorks so buyers could be productive immediately. On September 14, 1992, Apple unveiled the first Performa models. The trio included the 200 (a rebadged Classic II), the 400 (a.k.a. the LC II), and the 600 (the poorly received Mac IIvx, but without a Level 2 cache). The $1,250 Performa 200 was already a dinosaur, a throwback to the era of the black & white all-in-one Macintosh with a 9″ display. 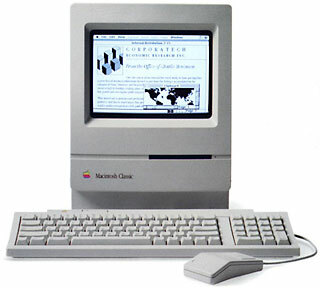 Introduced in 1984 with the original Macintosh, the design was cute and compact, but the screen resolution (512 x 342) was far from practical. The Classic II was the end of the 9″ b&w Mac line, and it had already been on the market for almost a full year. All the Performa 200 really had going for it was price. It was the cheapest Performa by far, and the 16 MHz 68030 CPU was still an adequate performer in the System 7 era. The Performa 400 (also known as the 405, 410, and 430) had already been on the market for six months as the LC II, a slightly updated LC with a better (but no faster) CPU and more onboard memory. The LC had been the smallest, least expensive Mac ever made, and the LC II already retailed for $1,000 less than the original LC had when it was introduced. The Performa 400 included a built-in modem (not a feature of the LC II) and the inexpensive, mediocre quality 14″ Performa Display. Memory expansion was limited to 10 MB, and it had a single LC processor direct slot. At the top, and selling for nearly $3,000, was the Performa 600, which had a 32 MHz 68030 CPU – twice as powerful as the other Performas. It was the first Mac to ship with a built-in CD-ROM. This was a 2x unit that required you to put your CD in a caddy. The 600 motherboard was different from the IIvx in that it could not accept a Level 2 cache card, which dropped its performance below the level of the 25 MHz Mac IIci. However, it could take the same processor upgrade cards in its processor direct slot (PDS). The 600 had three NuBus expansion slots and supported up to 68 MB of RAM. In February 1993, Apple released an updated Performa line. The 250 was a Color Classic, and the 450 was an LC III. The 250 had the same level of performance as the 200, but with a color display and a built-in microphone. The Performa 450 was quite a step up from the 400, moving from a 16 MHz CPU to 25 MHz, from a 16-bit memory bus to 32 bits, and from a 10 MB memory ceiling to 36 MB. In June, Apple unveiled the Performa 520, essentially a Performa 450 with a grafted-on 13″ Trinitron display and a CD-ROM drive. It was replaced by the slightly faster (33 MHz vs. 25 MHz) 550 in Feb. 1994. In October, the 450 was replaced by the 460, which bumped CPU speed up to 33 MHz, and the Performa 275 (a rebadged Colour Classic II) brought the all-in-one color Performa to the same level of power. The first 68040-based Performa, the 475, was introduced at the same time. It was essentially a Quadra 605 that used the less costly 68LC040 CPU, and it was plenty powerful for a home computer. In July 1994, Apple introduced the 33 MHz Performa 630, easily the most flexible Performa to date. It was the first desktop Mac to use lower cost IDE hard drives, already in widespread use on PCs, instead of the more costly SCSI drives Apple had used since 1986, and it included an LC PDS plus a comm slot plus an A/V slot that could accept a video I/O card or a TV tuner. It also had room for an internal CD-ROM drive. The 630 had a bit more power than the 475, but the CD-ROM support and extra expandability were what made it a favorite. In a nod to the Windows world, Apple also sold the Performa 640 DOS Compatible, which included a PC-on-a-card inside the Performa 630. Its companion on the all-in-one front was the Performa 575 (it had been introduced in February), which had the same level of power and the same flexibility, but with a built-in Sony Trinitron monitor. It was the last Performa with a SCSI drive. The Trinitron display made the 575 expensive, and Apple introduced the Performa 580 in April 1995. To keep costs down, it used a non-Sony CRT and an IDE hard drive. 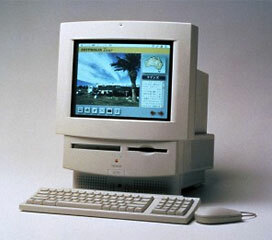 Apple introduced the first Power Mac models in March 1993, marking the start of the PowerPC transition. 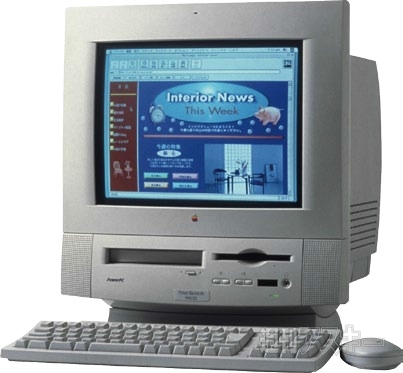 The 60 MHz Performa 6100, rolled out in late 1994 and was bundled with Apple’s decent Multiple Scan 15″ Display and the okay AppleDesign Keyboard. Apple really loved to hold on to existing designs, and the next generation Performas, released in May 1995, put PowerPC processors in the same case as the 630, starting with the Performa 6200. It was great in theory, but Apple’s engineers cut a lot of corners, essentially grafting a PowerPC 603 CPU onto a logic board designed for a Motorola 68040. In simple terms, Apple had put a chip designed for a 64-bit bus on a 32-bit data bus (something the 603 supported). Because the CPU could only access 32 bits of data per memory cycle, it ended up taking twice as long to read information from memory. The motherboard architecture also split functions over two halves that could only communicate through the CPU. This design handled networking, audio, ADB, and SCSI on one side. On the other were system memory, the IDE controller, the video circuitry, and the optional TV tuner. As long as everything was being handled on the “right” side of the board, no problems – and that was most of the time, as the hard drive, system memory, and video were all on the right side. The problem came when using the “left” side – accessing the CD-ROM (a SCSI device), using a built-in modem, or networking with an ethernet card in the comm slot. There was no direct memory access between left and right; all data had to be received by the CPU from the left side and sent to the right side to reach the computer’s memory. It was a cheap kludge, yet most of the time it wasn’t a problem. If you weren’t constantly accessing the CD-ROM, an external SCSI hard drive, or using a SCSI scanner, and if you weren’t using a modem or comm slot ethernet, everything went fairly smoothly. But put that machine on the Internet, which requires moving data from left to right, and it’s another story altogether. The Performa 5200, an all-in-one design with a built-in 15″ Multiple Scan display and stereo speakers, had exactly the same motherboard, as did the later 5260, 5300, 6260, 6290, 6300, 6310, and 6320. Apple finally fixed the x200 design problems in April 1996 with the introduction of the Performa 5400. Instead of putting a PowerPC processor on a cobbled together Quadra logic board, it had a mainboard designed from the ground up for the PowerPC 603e CPU and PCI expansion. It was joined by the Performa 6360 and 6400 in October. 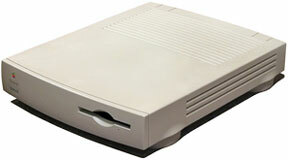 The 6400 was the only Performa in a tower configuration, and it was the only Performa with more than one PCI slot – it had two. When these models were replaced by the 5500 and 6500 in February 1997, the Performa name disappeared. These were now Power Macs. Steve Jobs had killed off Apple’s consumer brand – and a team was already working on its replacement, the iMac, which would be unveiled in May 1998.